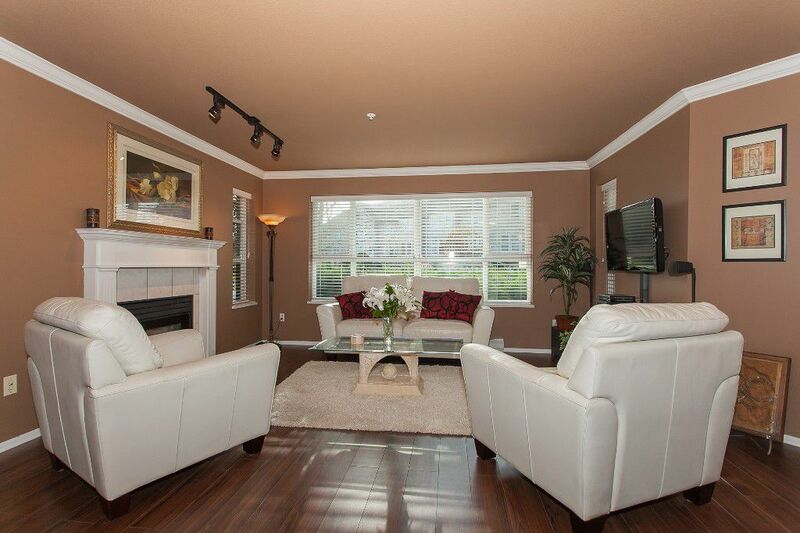 BRIGHT & BEAUTIFUL SOUTH WESTERLY CORNER 2 BD 2 BATH GARDEN SUITE with 2 PATIOS in SOUGHT AFTER Monterey Grande! AMAZING OPEN LAYOUT with WINDOWS GALORE floods this home with NATURAL LIGHT + greenery surrounding the entire suite makes it TRULY SPECIAL. UPDATES incl: Kitchen Quartz countertops, Stainless Steel undermount sink, subway tile, polished chrome faucet, tile & laminate flooring, garburator, appliances, 2” blinds, walk-in closet organizer & lighting. Bedrooms at each end of the unit. Rainscreened healthy building. Cozy gas fireplace. Gas & Hot Water included in Strata Fees. Separate storage locker steps away on same floor. These floorplans rarely come available & do not last…GREAT INVESTMENT & fantastic place to call home!